Consumers have been clamoring for organic and natural private labels, but it’s not always easy for smaller, independent retailers to enter this market. Many large retailers have thrived with such offerings, exemplified by Kroger’s Simple Truth line of more than 1,400 organic, natural and free-from items. The brand generates more than $2 billion in annual sales and is thought to be a key component of the chain’s success in competing against Whole Foods Market. “In the world of private label, the fastest growing grocery brands at retail are in the wellness category,” said Carl Jorgensen, director of thought leadership at Stamford, Connecticut-based retail services firm Daymon Worldwide. The wellness category of private label includes organic, natural, free-from, clean-label and better-for-you items, he explained. “They are the bright spot in private brands, so retailers are putting a lot of resources into those,” he said. Consumer interest in private label overall has been increasing. More than half of consumers—61 percent—said they purchase more private brands than they did two years ago, according to Daymon’s 2018 Private Brand Intelligence Report, and 84 percent say the quality of private brands is at least as good as that of name brands. In addition, 74 percent say private label is a better value for the money, and 53 percent say they shop at a store specifically for its private brands. According to research from The Hartman Group, consumers are generally pleased with the private label assortment in the natural/specialty retailer segment, with 40 percent agreeing such retailers offer a good selection of these items. That percentage is the same as for traditional supermarkets, but it trails the industry-leading club channel, which garnered a 44 percent approval rating for private labels. For smaller retailers seeking to launch their own private brands, one of the key challenges is finding manufacturers willing to produce a small quantity of private-label product, said Jorgensen. Matt Lurie, president and CEO of Organic Garage, a three-unit natural and organic retailer based in Toronto, agreed that meeting minimum order requirements is a challenge his company has dealt with as it has expanded its Kitchen Originals private label. To meet minimum order requirements, Organic Garage has focused on high-velocity, shelf-stable items for the Kitchen Originals line. The line was revamped about a year ago with new labeling and a new look, and continues to expand, Lurie said. It began with items such as packaged nuts, seeds and dried fruit, but has since expanded into a range of other common grocery items, including rice cakes, olive oil and canned tomatoes. Kitchen Originals, which focuses on certified organic products, is primarily positioned to be the lowest-cost option, without sacrificing quality, Lurie said. “I feel the customers are starting to look to the brand in each category to know that they can get a good quality product that is Certified Organic at an everyday affordable price,” he said. By focusing on shelf-stable items, Organic Garage is seeking to avoid the risk of loss through shrink from having too much perishables inventory, Lurie explained. “If you don’t get the sell-through [of fresh items], it can be problematic,” he said. 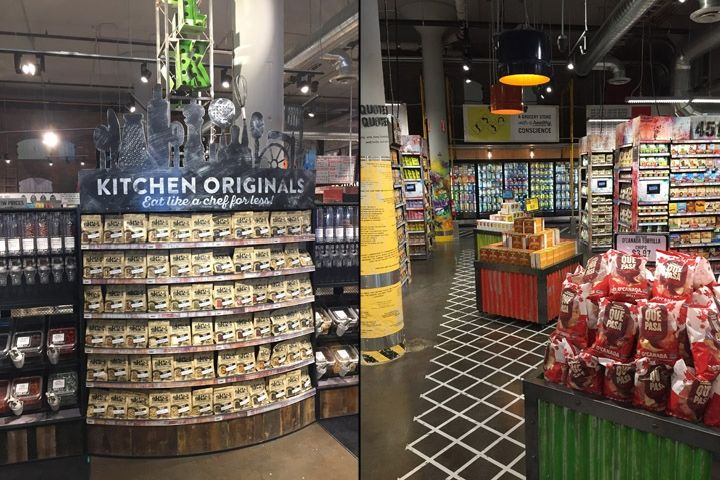 Kitchen Originals displays at Organic Garage. Certain fresh items, including packaged salads, bagged carrots, milk, eggs, chicken and beef, are among the highest-volume organic private label categories, however, said Daymon's Jorgensen. Those products’ packaging tends to make them easier to label than other fresh items, such as loose produce, he explained. In addition, some fresh items, such as vegetable-based noodles, are among the fastest-growing organic private label products, Jorgensen said. Snack combos packaged with fresh dip are another fast-growing item among organic private label, along with such shelf-stable items as bottled waters and performance nutrition bars. Although ordering in volume remains a key issue for small retailers when it comes to private label, Jorgensen noted that some manufacturers, such as Reliance Private Label Supplements in Edison, N.J., are willing to supply relatively small quantities of private labels. “With the tremendous growth of private brands in general in the marketplace, I would encourage small to medium-sized manufacturers to sharpen their pencils and see whether or not this could be a legitimate business for them,” said Jorgensen. Wholesalers also can provide some exclusive products or private labels to help independent natural and specialty retailers differentiate themselves. At Naperville, Illinois-based KeHE Distributors, for example, the exclusive Cadia brand includes an assortment that is 75 percent organic and 55 percent Non-GMO Project Verified. And for traditional retailers, KeHE offers the Made•With brand, which is targeted toward customers “who might be at the beginning of their journey into better-for-you food,” said Charles Sundstrom, VP of exclusive brands at KeHE. He cited research from The NPD Group and the International Food Information Council Foundation showing that more than 50 percent of consumers consider the absence of artificial colors or preservatives to be key in healthy eating. “It is no surprise that more consumers are turning to private label brands that have developed wide assortments of natural and organic products,” he said.